Skin that’s tired and bored by routine gets cleaned and toned with this invigorating body wash. It’s a zesty and creamy body wash packed with pure essential oils for a power-shower that refreshes your skin and your senses. Biodynamic® lemon peel oil is helps renew the look and feel of youthful skin. Free from synthetic detergents, our vegetable-based cleansers leave your skin clean and soft. Your skin is invigorated as it’s gently cleansed to promote your radiant beauty. Biodynamic® lemon peel oil and the finest essential oils revitalize the skin and tantalize the senses. Your skin soaks up our unique blend of replenishing natural nutrients and feels fully revitalized. Et voilà! Your daily routine just got a lot less routine. Skin that’s tired and bored by routine gets cleaned and toned with this invigorating Weleda Citrus Creamy Body Wash. It’s a zesty and creamy body wash packed with pure essential oils for a power-shower that refreshes your skin and your senses. Biodynamic lemon peel oil helps renew the look and feel of youthful skin. Free from synthetic detergents, this vegetable-based cleansers leave your skin clean and soft. Your skin is invigorated as it’s gently cleansed to promote your radiant beauty. Biodynamic lemon peel oil and the finest essential oils revitalize the skin and tantalize the senses. Your skin soaks up this unique blend of replenishing natural nutrients and feels fully revitalized. Et voilà! With Weleda Citrus Creamy Body Wash, your daily routine just got a lot less routine. Un pur bonheur pour la peau! Tout doux, se rince super bien et laisse donc la peau toute fraiche de propreté. Et ce parfum délicat mais reconnaissable de citron. Miam! 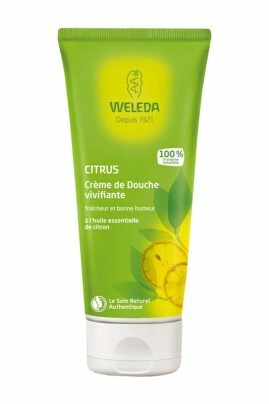 Apply Weleda Citrus Creamy Body Wash to the body with a loofah or hands and rinse thoroughly. Water (Aqua), Sesamum Indicum (Sesame) Seed Oil, Coco-Glucoside, Alcohol, Disodium Cocoyl Glutamate, Glycerin, Chondrus Crispus (Carrageenan), Citrus Medica Limonum (Lemon) Peel Oil, Xanthan Gum, Lactic Acid, Fragrance (Parfum)*, Limonene*, Linalool*, Citral*.